Our Cleaner is Concentrated... Please Dilute According to the Label. 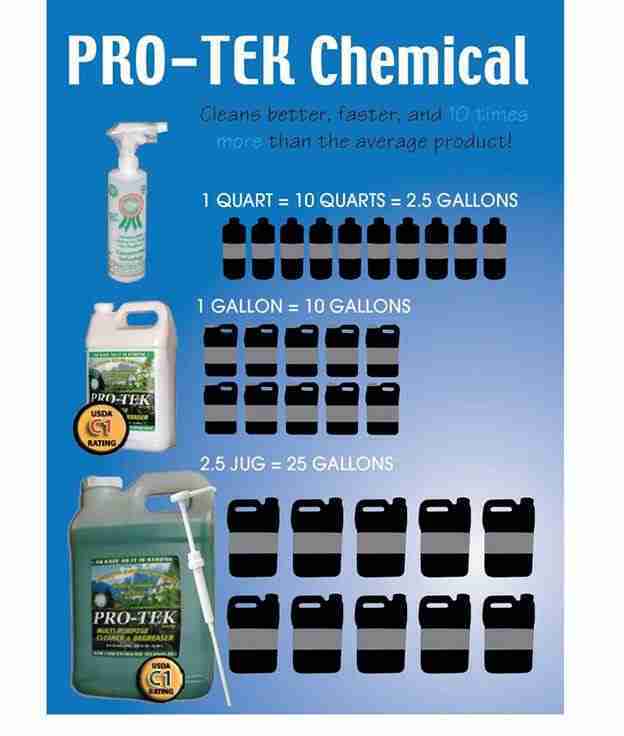 Pro-Tek™ cleaners must be diluted with water according to the dilution directions on the bottle. Never use the product as straight concentrate. Apply to water-safe surfaces and allow adequate time for Pro-Tek™ to penetrate the stain, grime or grease. For the most stubborn of stains, let it set for a little longer. Then, simply wipe away with clean, dry or damp cloth or sponge; no rinsing necessary! Although safe on most water-safe surfaces, it is highly recommended to pre-test on an inconspicuous area prior to cleaning carpets, painted surfaces, fabric upholstery or other surfaces which may not be colorfast. See table to determine the proper Pro-Tek™ to water ratio. To use the chart below, find the bottle size in the top row. Then, find the ratio desired in the left column. Where the bottle size and the ratio intersect, you’ll find the amount of cleaner to add to the bottle. Fill the rest of the bottle with water for the correct dilution. .5 oz. .75 oz. 1 oz. 2 oz. .75 oz. 1 oz. 1.5 oz. 3 oz. 1 oz. 1.5 oz. 2 oz. 4 oz. 1.75 oz. 2.25 oz. 3.5 oz. 7 oz. 3.25 oz. 4.5 oz. 6.5 oz. 13 oz. 5.25 oz. 7.25 oz. 10.5 oz. 21 oz. 8 oz. 11 oz. 16 oz. 32 oz. Have questions? Call us. We have real people who answer our phones. There is no such thing as a dumb question.